Hakusan, Japan, August 31, 2017 – EIZO Corporation (TSE: 6737) today announced the release of the RadiForce RX560, a 21.3-inch 5 megapixel monitor ideal for breast imaging. It features space saving features and new functionality for improving reading room efficiency. Breast cancer screenings are increasingly combining the use of mammography and ultrasound to view patients with high breast density. Furthermore, if breast cancer is suspected, various other tests may also be needed such as biopsy, breast MRI and CT – which require color monitors. 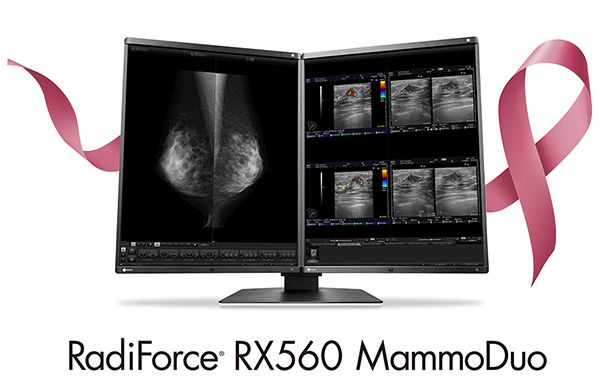 The RadiForce RX560 is the world's first medical monitor to use low temperature polysilicon (LTPS) liquid crystal display, and because of this, can reach the high brightness requirements needed for breast screening usually only possible in monochrome monitors. It can reach a brightness of up to 1100 cd/m2, meaning that it can display high-definition monochrome breast tomosynthesis and mammography images in addition to color images such as ultrasound and pathology. Furthermore it has a high contrast ratio of 1500:1, approximating that of a monochrome monitor, displaying deep blacks without any washout. The RadiForce RX560 is either sold as a single monitor, or as a combined dual monitor set called RadiForce RX560 MammoDuo. The RX560 MammoDuo includes a unique dual stand that holds both monitors at once. Furthermore, the stand is designed so that the height, tilt, and swivel of the two monitors can be adjusted without creating any gaps between them. The RX560 features the world's thinnest bezels for a 5 megapixel monitor, which when combined in the RX560 MammoDuo, creates a combined bezel width of only 15 mm. Additionally, the bezel sits only 2.5 mm above the screen, making it almost completely flush with the screen. All of this helps to reduce distractions when working between the two screens. As the RX560 MammoDuo is two monitors held by a single stand, its size has been significantly reduced compared to conventional side-by-side configurations. It has been reduced by 67 mm horizontally, 36 mm vertically and 20.5 mm in depth. The total space occupied by the monitor has been reduced by 22%, creating an unrestricted environment with expanded viewing space. The RX560 introduces a new function called Point-and-Focus to EIZO's Work-and-Flow – a variety of monitor functions which help to improve usability for radiologists. Point-and-Focus allows the user to select specific areas of your screen and focus on them using a mouse and keyboard. This function changes the brightness and grayscale tones of the selected areas to make interpretation easier. The RX560 also comes with the new Hybrid Gamma PXL function, which automatically distinguishes between monochrome and color images pixel by pixel, creating a hybrid display where each pixel has optimized grayscale; improving accuracy and reliability compared to conventional area-detection methods. The RadiForce RX560 will begin shipping in September, 2017. Date of availability varies by country so contact the EIZO group company or distributor in your country for details.